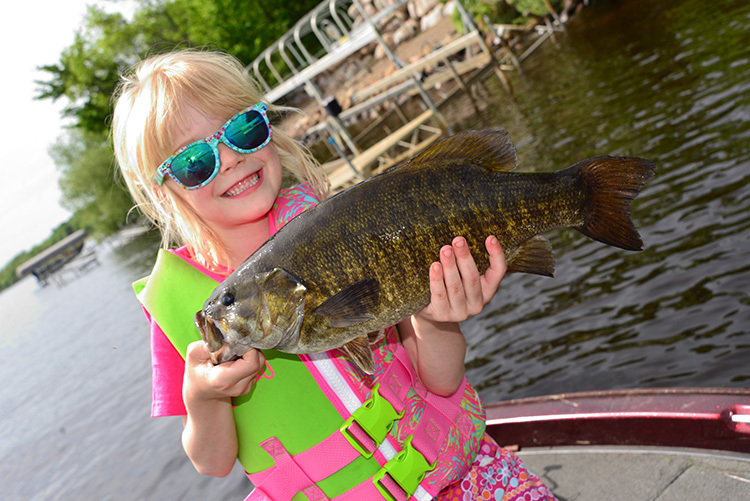 Kids love to fish and if you can up their odds for catching bigger fish and different species, so much the better. Here’s how. When it comes to fishing with kids, conventional wisdom says to find a place where they can catch any fish with a high level of frequency and you’ll make a fisherman for life. That’s true. 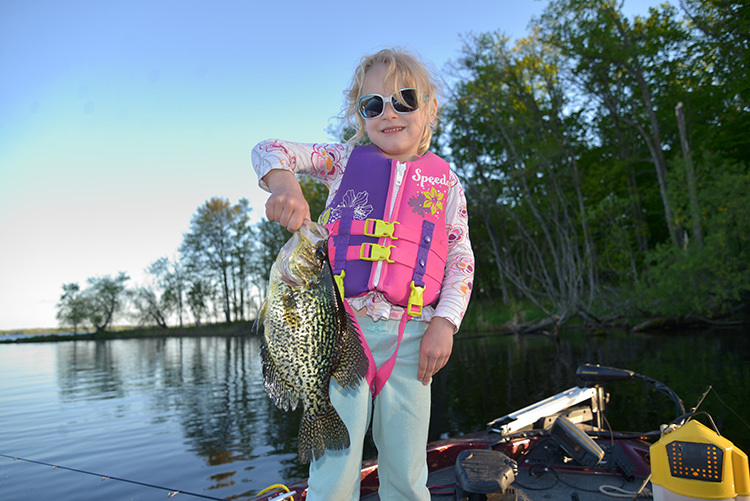 Fast-action is always a positive, but if that action means catching small panfish over and over with no variety, kids can lose interest. However, if that action includes taking a variety of fish with the possibility of maybe catching a whopper, then they will enjoy fishing all the more. 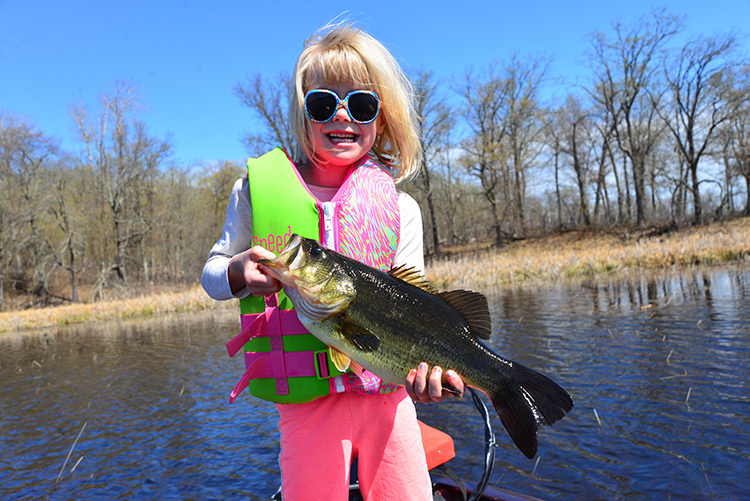 Getting kids into bigger fish takes a little effort, however, as a recent outing with my girls taught me. Our choice was either to fish off of the dock or take my twin three-year olds into the boat with my wife and try to find a more interesting spot to fish. It would have been easier to stay on the dock, but I had a hunch we could find a place that would provide better action than the small panfish that congregate near shore. 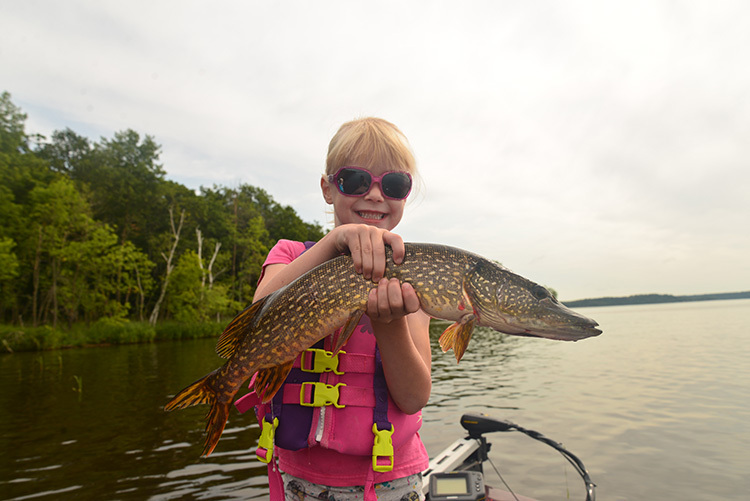 Kids thrive when the fishing action is hot, especially if there is the chance to catch multiple species—and possibly—a big fish, like this northern pike. With the whole crew in the boat, we idled to a point of pencil reeds that mark the inside of an old river channel. A slight current moved through the reeds, and a nearby drop-off provided some depth. In addition to finding sunfish, I thought we might catch a few other species. We did. Not only did we find bluegills tucked into the pockets between the reeds, but we managed to catch perch, rock bass, crappies, small northern pike, and a bonus 21-inch walleye. Since that experience, I’ve looked at fishing with kids in a whole new way. The scenario above sounds simple enough, but it took some careful consideration. Here are three key factors to consider that will put your kids onto fish and maybe, onto a monster to boot. Simply using two types of bait, like nightcrawlers and crappie minnows, can allow your youngsters to catch more - and different - kinds of fish during an outing. Simple is good when you’re fishing with kids, which is why I like to start kids out on bobbers and bait. (Kids love watching those bobbers twitch when fish come calling.) Most often, parents will pick up a dozen nightcrawlers and call that good enough. The thing about that is, nightcrawlers are deadly on panfish and perch, but they’re not the best choice for other species. It’s a much better idea to pick up a variety of baits, so pick up some leeches or minnows as well. Quick Tip: Keep a needle-nose pliers and a line-cutter handy at all times when fishing with kids, because you’ll eventually need them. Personally, I’ll take a scoop of fathead minnows over anything else. These minnows are large enough to take some abuse, but not so big that nearly any fish out there can eat them. And fish ranging from crappies to bass to walleyes and northern pike love minnows. 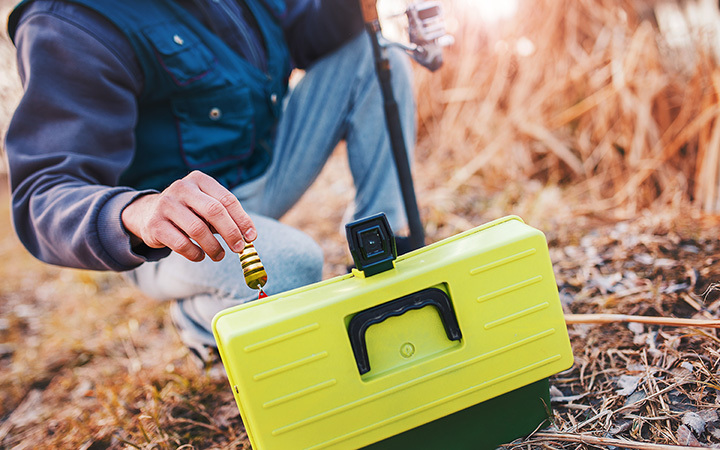 With one setup using a nightcrawler and the other using a minnow, you’re now greatly increasing your chances of catching different kinds of fish. Leeches, which always fascinate kids, are another choice that will increase the odds of diversity. Change the depths at which you set the bait below the bobbers to find the sweet spot. Oftentimes with worms, the closer to the bottom you can get, the better. With minnows, having them suspended a foot or two off of the bottom might be a better bet. Naturally, it doesn’t matter how deep your bait is set if you’re not in a good spot, so you’ll have to figure out where to fish that might offer multi-species action. Shallow bays containing pencil reeds are good stops to make early and late in the day when larger species, like this largemouth bass, feed in close to shore. If you can find some wood structure, you’ll up your odds for landing a bigger fish even more. To find a great fishing spot for kids, try locating waters that may not get as much attention as super popular lakes near you. 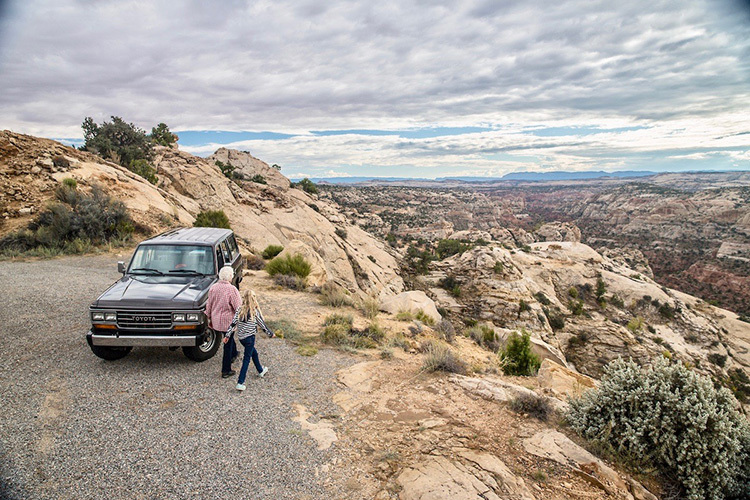 Then look for areas on those lakes that offer as many options as possible. For example, picture a rocky shoreline that is dotted with a few lily pads. That might look good enough, but was does it offer the fish? Probably not much. 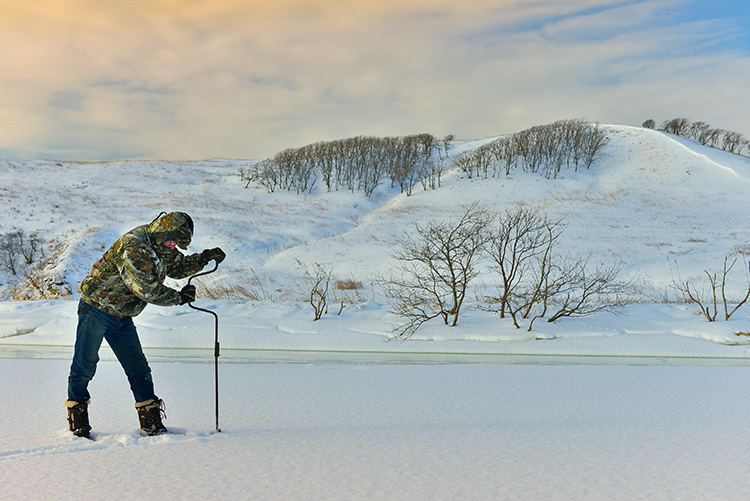 Now, follow that shoreline for a while until you get to a point that juts out into the lake. There, you’ll see the same rocks and lily pads, but also a potential current break (if there is any current). The point also probably extends into deeper water, which is always good. This spot, while it might not look much different than the rest of the shoreline, is most likely, better. Perhaps you want to fish a shallow bay that is full of pencil reeds and lily pads. One section will undoubtedly look as good as the next, so where do you start? In such situations I like to see if there is a beaver dam or some other kind of wood structure in the water. That added bit of habitat can change a sunfish morning, into something that includes largemouth bass or maybe crappies just by fishing closer to one extra type of cover. 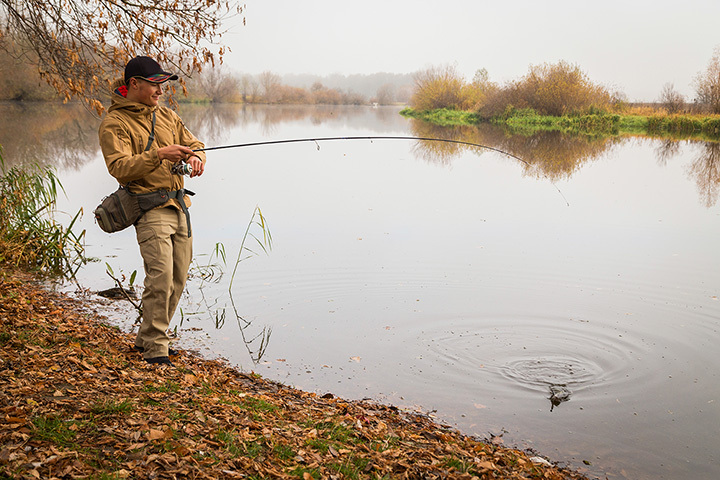 Quick Tip: Whether you’re fishing on shore or from a boat, have a landing net ready. Kids love netting fish, and it makes the process much easier. The added bonus to this type of fishing with kids is that it puts you in the spot to maybe catch something bigger, and believe me when I write this, kids want to catch something big. It doesn’t matter if it’s a smallmouth, a dogfish, a carp or whatever, the bigger the better. Getting familiar with a map of the area you’re going to fish before you head out can save you a lot of time. Mark a few places that offer any of the suggestions above and head there first. When the sun is high, fish head for shade. This is the time when working around docks and patches of lily pads can produce strikes by bigger fish, like this nice smallmouth bass. 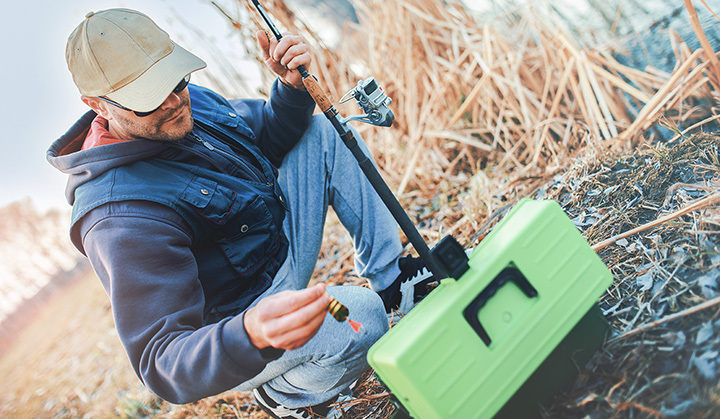 The right bait and a great spot will go a long way toward a memorable fishing trip, but you can hedge your bets even further by knowing in advance what times are best for fishing. I like to fish at sunrise and sunset, and while my little girls don’t like getting up at 5 AM to fish, when they do, they love it because they usually do pretty well. Get them out there in the morning or the evening when the temperatures are tolerable, and the fish will be biting. If you’re fishing plenty of weeds and wood cover, plan a trip when it will be sunny to take advantage of the fish tucking themselves into the shade. If you’re fishing a rocky point or island, wait for an overcast day if you can. Fishing with kids can, and should be, as simple as you can make it. But that doesn’t mean you should not plan to catch fish, especially multiple species of fish. 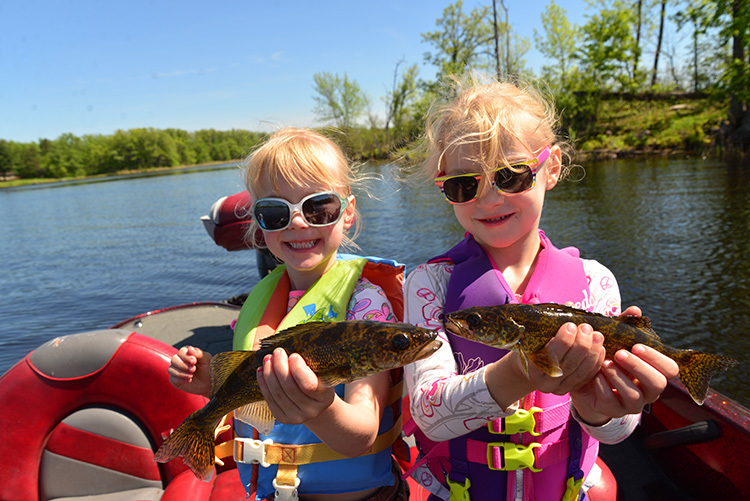 It takes a little planning to do it right, but one good experience where fish of all varieties pull their bobbers below the surface will do wonders for keeping your kids’ attention and excitement levels up. And if they catch a big one, well, you can consider it a job-well-done.